Flows Settling Down, Fishing Has Been Consistently Good…. Tues. Apr. 28, 2015…..Its Spring even though the past few days have felt very chilly , unseasonably so. But we’ve had a couple nice days, cool and dry with sunny skies. And all the flooding and high water from last week has settled down and while a few larger waters are still way up they are clear enough to call them fishable. Very fishable. Generally too, the smaller the water right now, the lower and clearer it is. But flows are great, and as we get into warmer weather it will be good to have good flows. On Monday I did a guided Trip guiding Dr Art Kriner, Greensboro, and his son-in-law Dave Wiebking, Kernersville, NC, I guided them on Wilson Creek Gorge/Pisgah Gamelands, great weather day, we covered lots of water and surprisingly the water was still quite high, above what I would have expected since its been several days since the flooding of Sunday and Monday. We did pretty well, not much in the way of dry fly fishing or rising fish, that mostly due to the water level, because there were bugs coming off and the water temp is in the low 50s…or in other words perfect. We had a good day, landing a 35 fish mix of rainbows and brookies. A handful of my new dead squirrel patterns and fished in tandem with a small rubberleg Copper Prince Beadhead did the trick for 90% of the fish. Quite simply, my dead squirrel jiggy fly killed them. We fished til late afternoon and then called it a day. A good many anglers on the water, the weather was gorgeous and I am sure that was why. It was very breezy with northwest winds of 25 to 30 much of the day…..as it normally will be after a cold front pushes through. Art and Dave were a delight to spend a day with as always. Just completed another trip video, this video clip has a number of clips from Monday’s trip. Click here or view below. Some of the clearest water and prettiest scenery in the mountains. I have fished this area for over 30 years and guided for almost that long. Have had a very busy month, a ton of redos and reschedules from last month with trips. The weather has wreaked havoc with the schedule for sure, and May is totally booked at this point and June is headed that way. Have also been very busy finishing up a huge pile of fly orders….busy doesn’t begin to describe it. Have a busy weeks’ end coming up, will be guiding Bob & Judy Zirt, Lexington, NC, Ted Linczak, Charleston, SC, and Saturday Dr Jeff Hutchison, Columbus, OH. Should be some great weather too…..I can’t wait. 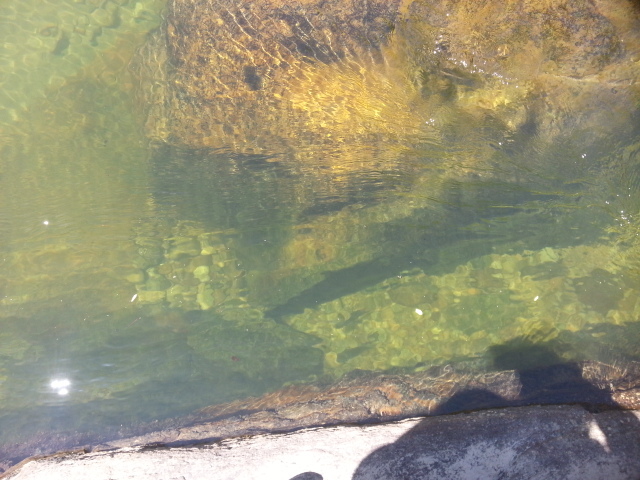 There are two fish on the bottom here in about 8ft of water….they are slightly below center in the photo, with another nice fish slightly higher and near the right edge. Can you find them? Good End to a Challenging Week…..
Mon Apr. 27, 2015…. 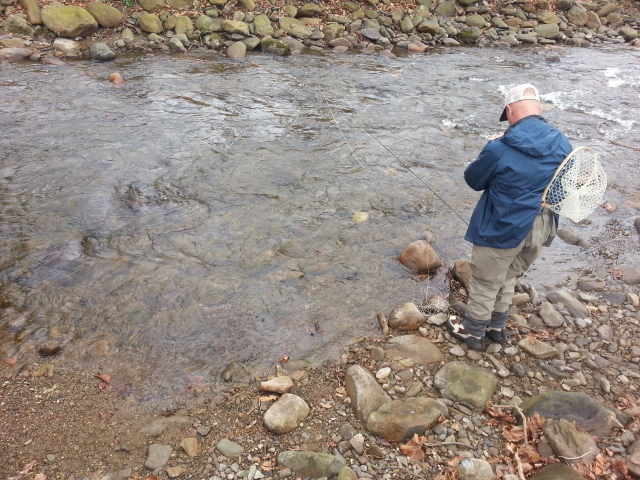 Thursday through Saturday i did a 3 angler Guided Trip, Ted Birke, Byfield, MA, Dr. Hy Muss, Pittsboro, NC, Dr Ken Karb, Greensboro, NC, a multi day trip and we had almost all types of weather except snow. Thursday was cold, blustery with winds to 50mph, rain then cleared off and windy. Right on the backside of major flooding, so water was still high and barely fishable even by the most loosely applied standards. 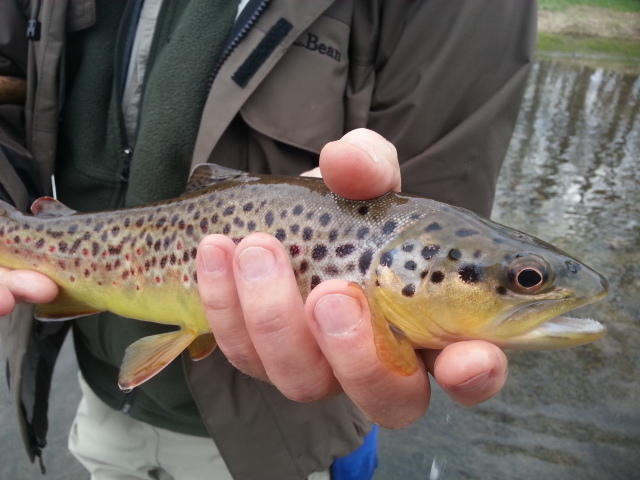 Thursday was decent, maybe 20 fish or so for the afternoon, including several browns in the 20″ class. 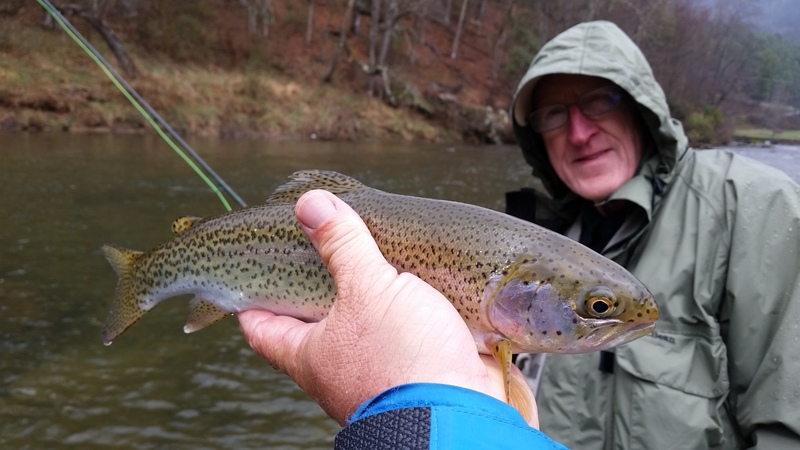 Friday we started with frost with temps in low 30s …..which felt painfully cold, and we fished Watauga gorge and it was sunny and very windy. Temps reached 60F but it sure didn’t feel like it. 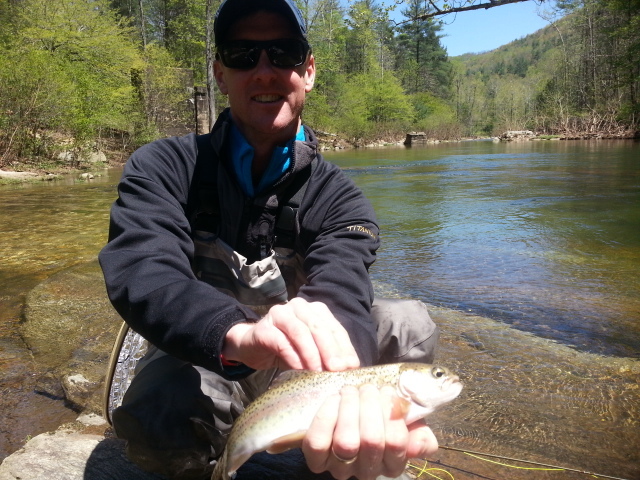 We caught a mix of rainbows and brookies, along with a few redeyes and even a couple smallmouth bass. We had to work for them, and ended up with probably 30 fish, and we fished hard. Water was high and still colored but fishable. And you could definitely see where the flooding had raised the water probably 12 feet above our heads where we were standing in the river. We fished several spots/areas and even found one spot where with the flooding about 12 to 15 fish had gotten stranded in a small, isolated pool of water in the woods at least 10 feet from the edge of the river, solid proof of what I’ve often believed, that fish move to the banks during really high water or a bank on the inside of a bend as that is where the softer easier flow is. These fish had gotten in there then the water receded quickly and left them in this small 10 x 8 pool of water. Ken and I corraled a number of them, caught about 10 of them and returned them to the river. We quit on Friday about 430pm and headed back to have dinner. Saturday we got up early, temps in the 40s and rain, some of it heavy. We had breakfast and hit the water about 9am, and by then the rain turned to light showers which we essentially over by 11am. Never rained another drop, though it was still cloudy and cool most of the day. Water was up again and colored, but we did pretty well, netting about 50 to 60 fish total on a variety of flies but my new muddy water squirrel and fire bead soft hackle pt fly, with the squirrel fished as the lead fly (tung head) and the fire bead pattern as a dropper, was easily the best combo netting easily 75% of what we caught. We had enough other fish on to top a 100 fish day and most of those that came off were also on this combo. Been a killer setup during the last two weeks of high , stirred conditions. 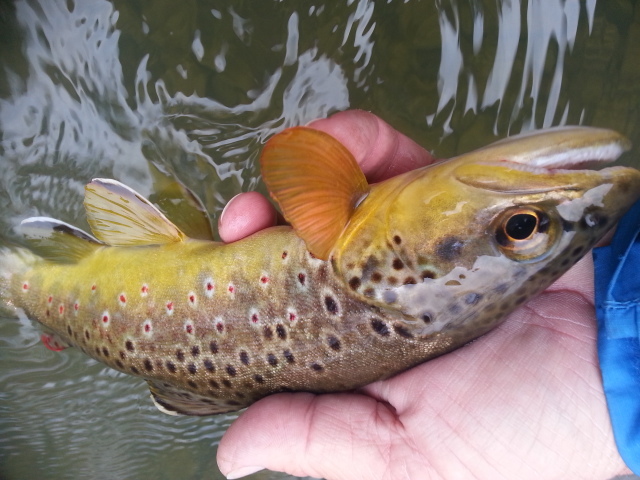 The several 20 inch browns of Thursday, all of them ate the fire bead soft hackle fly. We fished til about 4pm and called it a day and everyone headed home. I stayed and scouted a few other waters in prep for this upcoming week’s trips, and in so doing caught probably 8 or so in the few places I scouted. Water is still very high, and we need a few dry days this week. Any rain of any magnitude right now will be , unfortunately, a blow out in short order as the ground is saturated. Headed out early this morning to guide Dr Art Kriner and Dave Wiebking on a wade trip to remote Wilson Creek gamelands. Looks like the best weather day in are while. Flooding in the High Country…..
Thurs. Apr. 16, 2015…..Yes, that is the ugly word today…..Flooding. Not massive flooding like we can often have, but high, dirty conditions limiting fishing to almost lakes only or tailwaters if you have a boat. Other than that, slim pickings the last two days as we have gotten between 2 and 4 inches of rain area wide. Today is cold with rain/drizzle as we are in that common Appalachian cold air wedge, and it moves away tomorrow as some warmer air moves in. But with the warm air comes…..if you can believe it…. a thunderstorm threat. Chances are 40 to 50% as warmer air moves in. Could be an interesting weekend. We’ll see…. 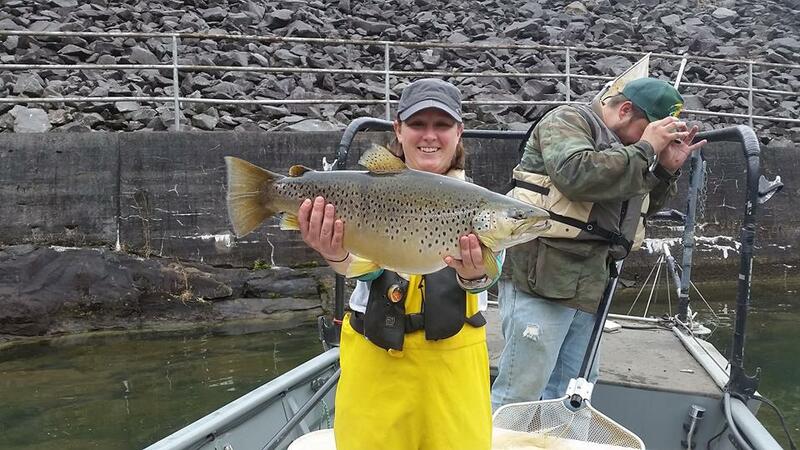 Pictured above is Amanda Bushon, a Wildlife Commission fisheries biologist, with a 10-pound brown trout during a sampling at Apalachia Reservoir, west of Murphy. We’re experimenting with stocking larger than usual hatchery-reared trout in the lake to see if they will take advantage of the invasive blueback herring forage base. Read about it in Wildlife in North Carolina magazine, a piece written about this developing fishery by my friend Mike Zlotnicki of the NC Wildlife Commission click here . Mike and I have done several past articles together for a couple of Sportsman’s magazines. 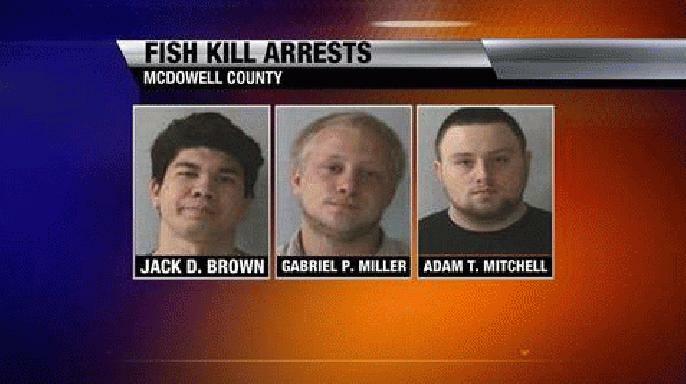 NEWS UPDATE: Armstrong State Fish Hatchery Vandals Arrested… Three men have been arrested after police say they tampered with a local hatchery over the Easter holiday/opening day of trout season weekend, killing more than 150,000 rainbow trout. Read the scoop here . This story broke over the Easter holiday and news is also that stockings will go on as planned with no noticeable impact to anglers. We do a lot of videos on our fishing guide trips when we are able, and fortunately I have been able to put some out even though its been incredibly busy. Here are several videos over the past couple months, enjoy…. We’ve have some great trips lately, the fishing on all days has been good, some days it has been off the charts. As good as I have had….ever. We have fished a little bit of everything too, and done very well on all of it. 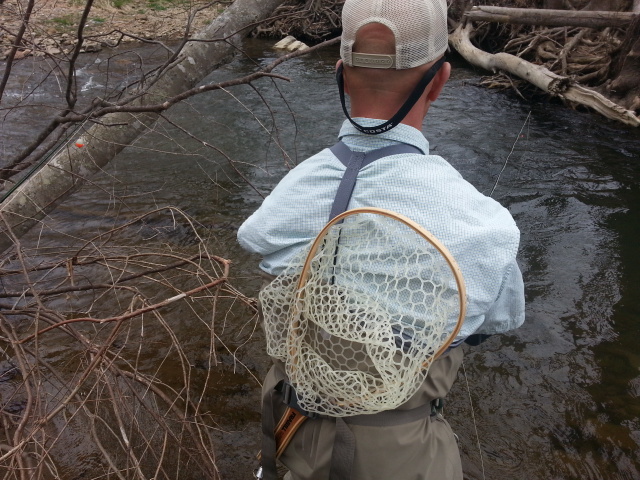 We still have yet to see our best dry fly fishing, but for sure. It’s coming. Soon. Very Soon. We post a ton of stuff on Social media as well. You can follow us on any number of sites, our Facebook page is here . 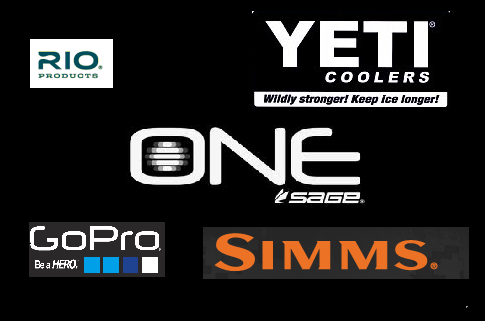 Our Twitter ID is @JWFlyfishing and our page is here , and our Instagram ID is @JWflyfishing and our page is here . You can sometimes find additional pictures and content we only post or offer there. Recently got a nice Testimonial from a client Ted Linczak, Charleston, SC…….. Thanks Ted! That means I achieved the goal for the day. Huge South Holston brown landed by my client Tom Wright, Archdale, NC, one of the largest brown trout I’ve ever had a client land, and especially a feat given he landed the fish on a 3 weight rod. Incredible. Tues. Apr. 14, 2015…..Sounds like a broken record but its true. Flood watches over the mountains last night, and we escaped the worst of the rain to start the week and also did the same yesterday. Don’t know how it will hold out the rest of the week, mainly because we are entering a wet pattern coming up and the potential for heavy rain exists all week. Its of particular interest to me, and my clients as well……as it could mean some blow outs. We’ll see. On Monday I did a guided Trip, Larry Tomar, Greensboro, NC, NC Mtns, we dodged a major rain bullet even though we did fish in on and off showers/mist much of the day the heavier stuff held off fortunately, which is good because where we were the water was already high n’ dirty but I felt we could still do well as I know where the fish hold/pod up when the conditions are not so good. It was dirty/off color, not muddy or blown out. That’s a different story when its like that. But today, though marginal in terms of conditions, the fish cooperated and did just what I thought they would and Larry and I were blessed with a great day. We started slow, catching one here, one there, then around 11 am things picked up a lot, we eventually ended up with between 50 and 60 fish to net, many on my new nymph patterns. Larry did a great job as well, the high flows weren’t easy to wade or fish but we did well despite it all. We got the best fish of the day, a big rainbow in the next to last spot we fished. It was great, and a great day again……folks often ask the secret to staying in the fish day after day. I am constantly developing new flies. 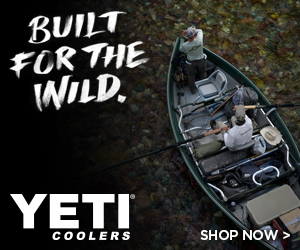 We don’t fish stuff everyone else fishes, its all our own, and that is one reason why it works. 2- am blessed more than I deserve , 3- you have to know how to change things up when conditions change, where fish move, how they feed, what they can see, proper rigging and use of weight , indicators as well as when not to use those things. All of that factors in. But it was a great day, Larry was great to be with as always, and I was glad we got in a full day, a great one, as he loves to catch fish as much or more than anyone I know. That’s saying a lot. I call it passion….and he has it. Have a day and a half off to catch up on a pile of ‘office’ stuff, the type of stuff that comes with a small business, and lots of messages to catch up on. Time has been at a premium as my mom is very sick still and was readmitted to the hospital …many thanks to many customers for their best wishes. It is greatly appreciated. Thurs. Apr. 9, 2015…..Simply no other way to put it. I guided Dr Steve Hardy today and we had a banner day. With the threat of storms we got an early start, the water was still high where we fished …mostly from yesterday’s storms. I knew if it was clear enough to fish we could have a great day. We saw only a few rises all day so we spent the day slinging big uglies. Steve put between 50 and 60 fish in the net by my guess. We caught them on a variety of flies but by far the most effective was a Squirminator tied in yellow/orange …which imitates hognose sucker spawn where we were. We fished right through til a severe thunderstorm ended our day around 4pm. But that was ok, Steve put a slaying on them for sure. We left as a really heavy storm moved in and the sky and horizon was rife with storms in all directions. Will be interesting to see if water levels hold up as a big line of storms was out to the West and poised to move through later this evening. 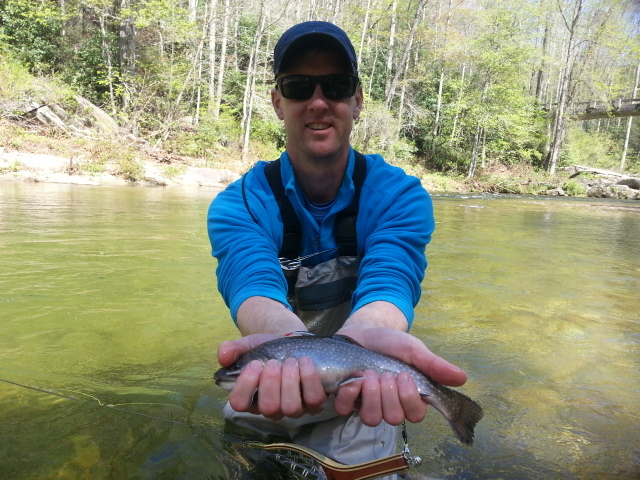 I am supposed to guide a trip on upper Wilson tomorrow , will be guiding Jack and John Keller, and Danny Mirtz, all from Stokesdale, NC. Could blow us out if it rains too hard. 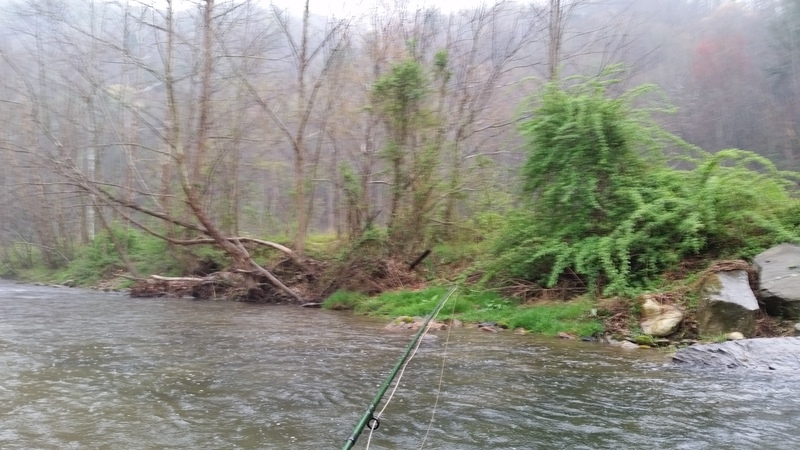 Wet and Rainy Yes…..But Fishing Has Been Epic…. Wed. Apr. 8, 2015….. Been a busy Easter holiday weekend plus a busy start to the week as well. Its been a wet/rainy period, and will likely be that way all week, but it hasn’t hurt the fishing much. And that’s notable given the heavy spring frontal systems w/rain we often get in spring. But then again, that’s why we buy all that expensive snazzy raingear. If the fishing is good why sit in the vehicle? 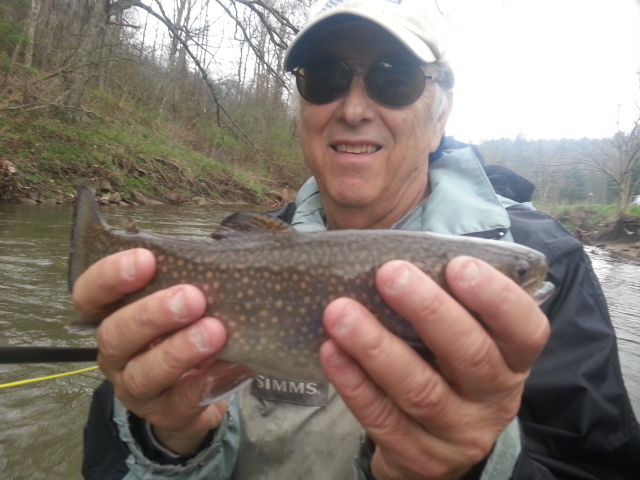 I started the week guiding Anthony Hipps, Lexington, NC, Paul Gruver, Raleigh,NC, TN on a South Holston River float/wade trip. I met up w/Anthony and Paul and we got a very early start, partly due to the threat of weather and also it being a three day weekend and Easter Monday hopefully we would beat the other anglers. It was a bluebells and blue wings day, as the VA bluebells dotting the riverbanks were in bloom and the blue winged olives were flying. We were in the water at 7am, and It proved a good move, we caught a lot of fish nymphing with standard rigs and then with dry /dropper rigs, I suspect we’d landed 25 or more by 9am. A good mix of browns and rainbows, Paul absolutely slayed them, landed about 15 fish in one spot I had put him in. Its always a great area early in the day as the fish stack up or pod up and usually every drift for the first several results in a hookup. 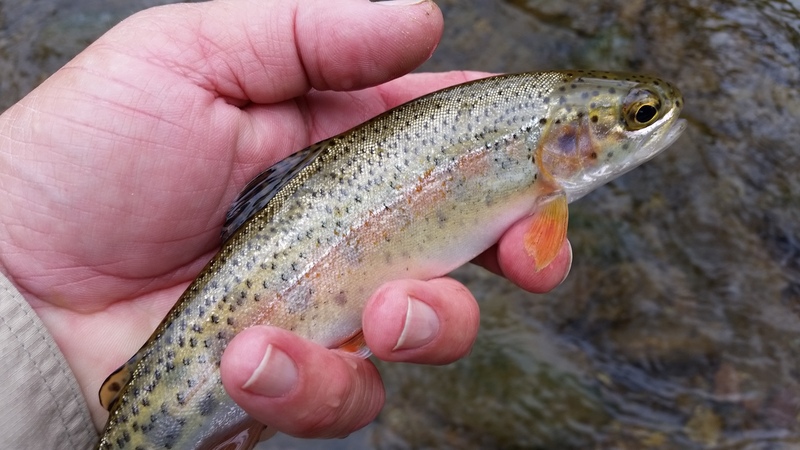 Several quality rainbows and browns up to 15″. We started to see fish rise, we put on one of my new CDC thread body duns and it smoked them, we scored several other risers on that fly as the blue winged olives started to hatch a little by late morning. 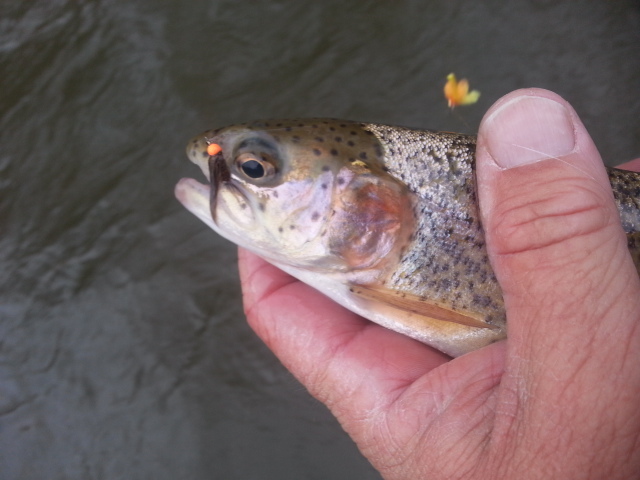 We fished til 1pm or so,then took a lunch break, then headed downriver to catch the pulse in the afternoon as I expected a bwo hatch on that part of the river. And so it was, at first it was just getting going, and while Paul was red hot in the morning, Anthony started to slay them on a bwo dry I’d given him. Absolutely slaying them…..Anthony must have landed a dozen to 15 in that spot, then we all moved downstream 1/8 mi to where I knew we’d find some good fish and also likely get into a hatch as the pulse came through. Happened exactly as planned, the hatch came off and for about 3 hrs we had rising fish all around. The guys netted probably another 15 to 20 fish or so. 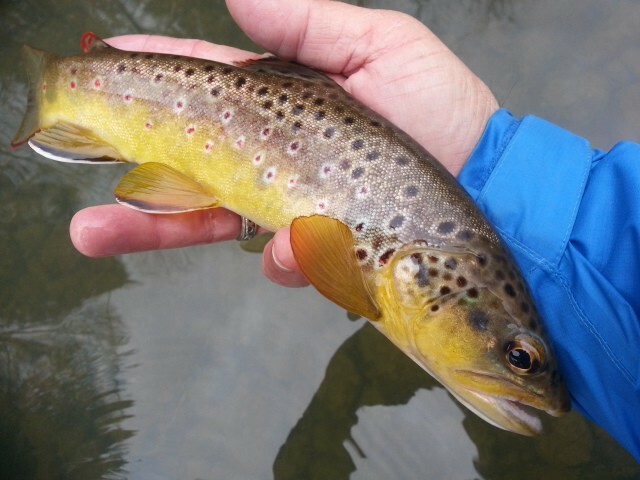 We got fish on dries and dry /dropper rigs, and several good fish…..and all browns, the beautiful, snooty, cagey wild browns the Soho is known for. 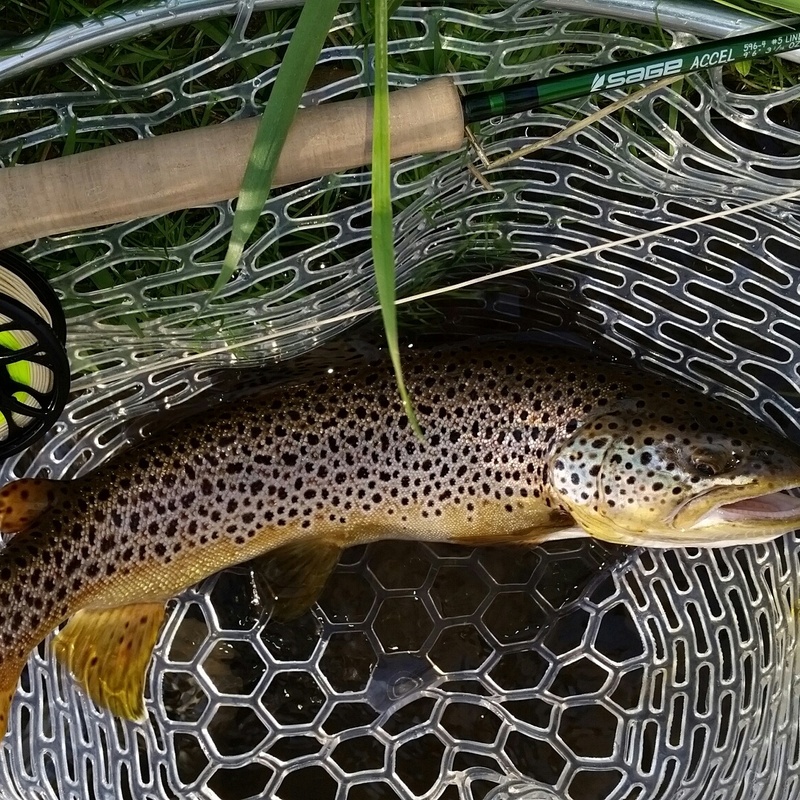 For probably an hour or so the dry fly fishing was truly epic, the stuff dreams are made of. The pulse went through, and the fish settled down somewhat, and the guys decided to call it a day. Truly satisfied, and a great day it was. We did get a couple of downpours, and several periods of light rain, but never the storms that were in the forecast. As Anthony said …..”Jeff, we’ve had a phenomenal day…”. I agreed. A 50 to 60 fish day, perhaps more than that, I lost count. And to think its really just getting started there……I can’t wait for what lies ahead. We missed the heaviest rain, but there were some storms to the West that eventually made it over the area and dumped some rain. On Tuesday I was set to guide Ron Rhoades, Greensboro, NC, NC Mtns, but we got tons of rain after I came off the river on 4-6 so we ppd it and rescheduling to a later date. It didn’t rain heavy everywhere, but it did where we were supposed to fish. 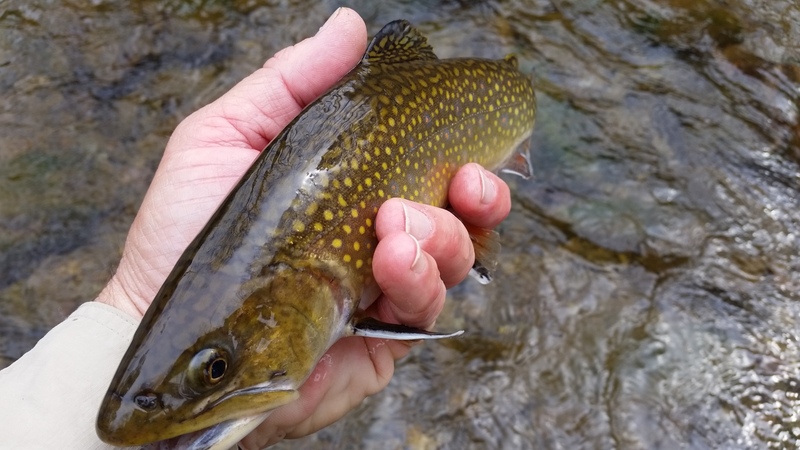 I had stayed over in Boone, NC, and on my way in today tested some new patterns on a couple local waters I fish some in the spring, one is a kind of hike in very wilderness like place. Fishing was fair, the suckers were spawning there as well, I tested out several new squirmy patterns, and some new egg patterns and bead heads. I must say the worked well, and a couple of them were lethal! Simple as that. 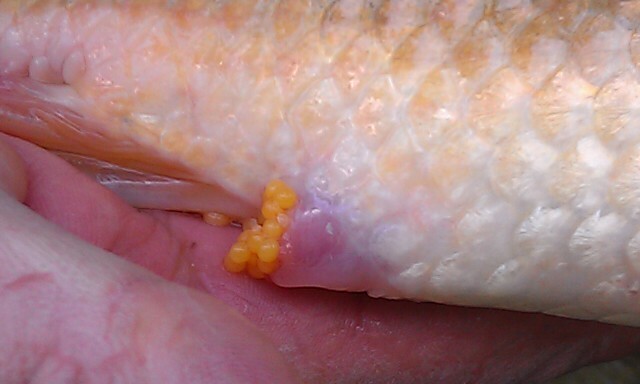 I mentioned that suckers were spawning in a lot of locations, these fish are common to virtually all of our DH waters and smallmouth waters too, and when they are spawning/dropping eggs the fish will key on them. That is one reason I have always used them in Winter and early spring, patterns that have an orange color/tint or peach/orange as the eggs are that color. The local hognose suckers in the front slope drainages have light orange eggs, and as you might guess, an orange Y2K, orange egg, or orange anything in #12-16 is often effective. Don’t have any of these patterns? Every box for our area should have some for sure. They can be ordered custom ordered tied by me, they can be ordered by the dozen here or by the fly here . A Bit of Rain……More On Tap For This Week…. Sat. Apr. 4, 2015…..Hope your Easter weekend is going well and wish you a Happy Easter as well. Today was supposed to include a trip but we postponed the trip due to muddy water where I was going to take my client Pete Bradley. Some parts of the mountains got a lot of rain while others just a trace. Hit or miss, but the places that got it….well, a good soaking it was. Yesterday’s trip we left just as the deluge came upon us. Just in the nick of time. I guided one of my regular clients Shaun Redgate, Shaun is from Forest, VA, just outside the Roanoke area. It ended up being an okay day until the end when we got dumped on, a few heavy bands of rain were coming , the water was up from recent rains but clear enough to fish and we killed them. Our original plan was to take Shaun over the mtn to one of our private waters but rains on Thursday night just put a smackdown on that plan, as the Clinch River valley and all of Russell and Washington Counties in VA got dumped on pretty good. 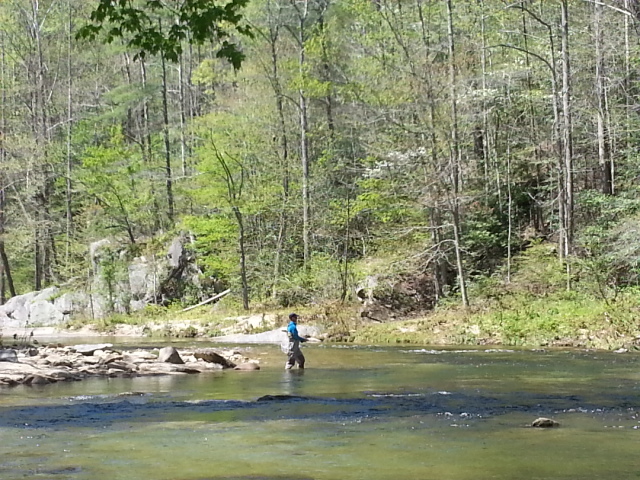 So we went to plan B which was to fish some in Ashe Co. I met Shaun in Galax, and we were off. It was good right from the get go, we were into fish right away, scored one , in fact, on his first cast. Second day in a row I have had that result. Fishing is definitely in full beast mode right now, good just about everywhere. The water was up and we didn’t bother throwing any dries, but we instead fished some right angle rigs using the Strike Foundry bobbers I’ve come to love so much. We did very well, scoring probably 25 to 30 fish before lunch. The fish was a beast……I see a lot of this and I must admit even I was kind of “deer in the headlights” shellshocked. 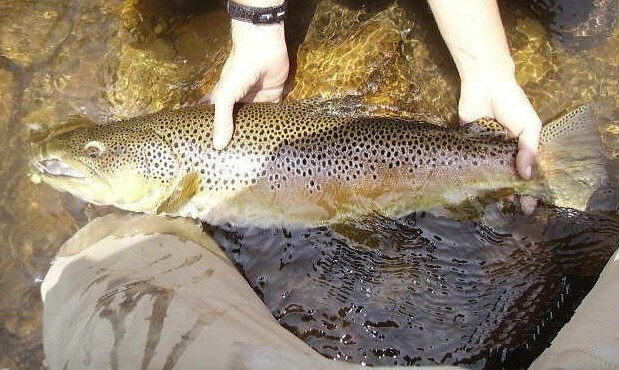 Shaun and I share a love of big browns, and have landed many together on the South Holston…including a huge brown of 22-24 inches he landed years ago with me on a guided trip….a rising fish that he landed on a #20 blue winged olive and 6X. This brownie was way larger, I was stunned. He did a masterful job turning the fish several times from the root ball on the bank, and fought him for at least 4 to 5 minutes, but there was a large limb underwater we didn’t see and that the fish made one last dash for freedom and successfully got himself wrapped on and broke off. We were both sick. Absolutely sick. Affected us the rest of the day. We fished on til the heavy rains set in, and must have landed another 25 to 30 fish, so we slayed them so to speak with what I’d guess was a 50 to 60 fish day but that brown in my mind is indelibly etched into the creases of my brain and I suspect both Shaun and I won’t be right for several days. It was truly what I’d consider a lifetime catch of a brown trout in NC. We had a great time, as always, and Shaun was great to spend the day with. Happy Easter to you, and many thanks for your business. May the Lord richly bless you all this Easter…. Great Fishing……..And a Big Rain’s Coming…. Fri. Apr. 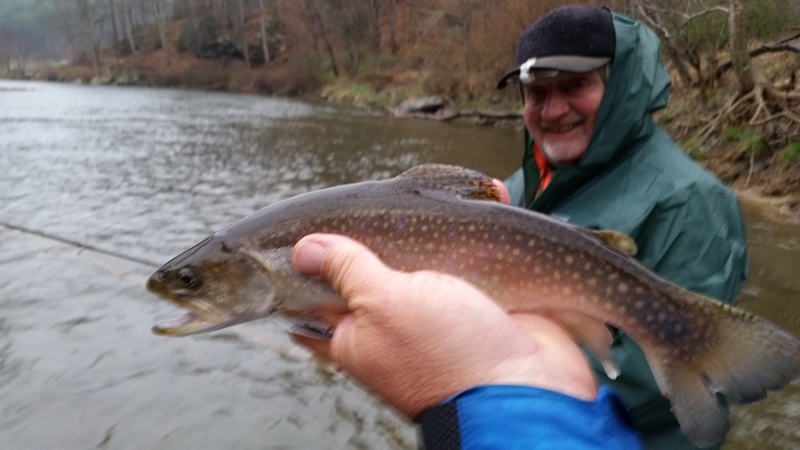 3, 2015…..Did a guided Trip, Ted Linczak, Charleston, SC, SW Va, yesterday and met Ted in Princeton, WV, and we made the quick run south to one of our private waters, we were in the water and fishing by 830am, and with low gray skies threatening we started fishing , first on the upper end of the property, this water is a trib of the Clinch River in SW Virginia. Yesterday were were after the bigs…..we fished all day and pretty late, til about 7pm. 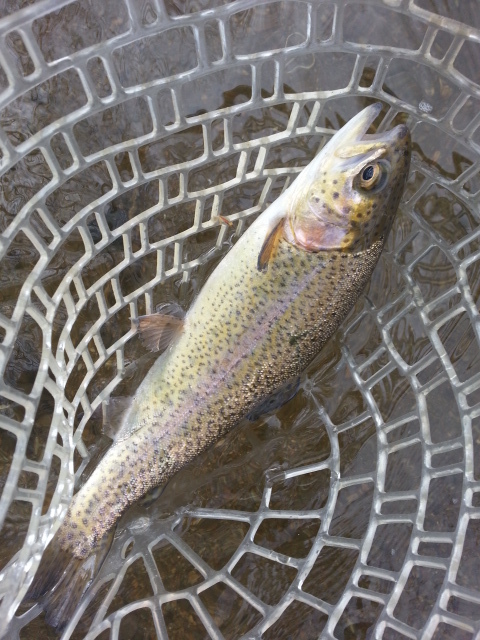 Fishing was pretty good in the am hours, fair midday , stellar in the afternoon. My concern was rain/thunderstorms but they held off til the end when we left under an absolute downpour. We had a great day, landing probably 30 to 40 fish and missing many others, and some of the fish pushing 10lbs. 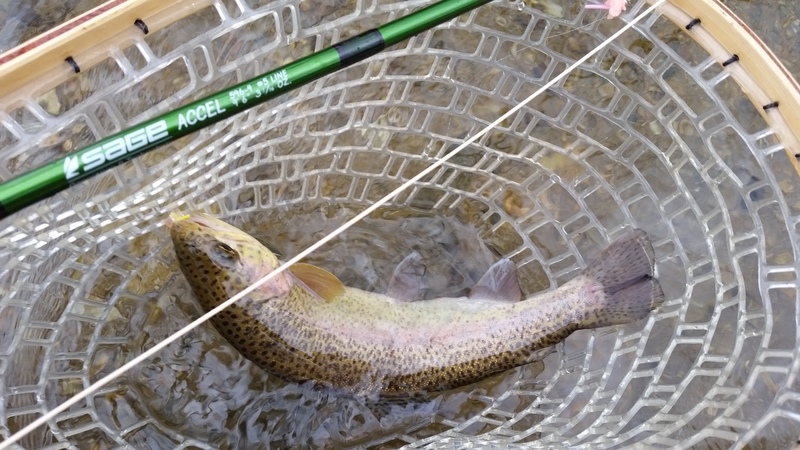 Probably 3/4 of the fish were over 20 inches….great day. We fished streamers, nymph rigs, and could have caught some on dries as there were some sporadic rises….but since what we were doing was working so well we didn’t change. 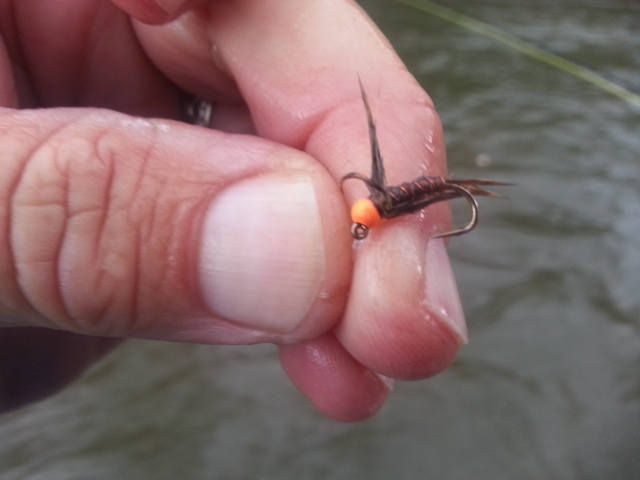 Fished several new nymph patterns , one a Y2K squirmy mini version, the Squirminator mini, and it was lethal…..downright destroyed them. We did well on rubberleg patterns too, and my dead squirrel, a perennial favorite, smoked ’em as well. I tie them on 90 degree jig hooks and with a tungsten bead and they are simply killer. 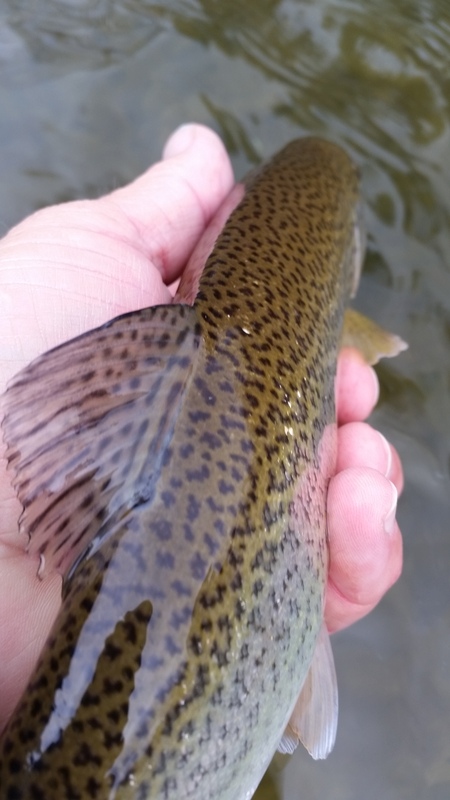 The largest rainbows ate that fly…..we landed a few smallmouth as well, one of the a quality one, as well as several hognose and redhorse suckers. The suckers are spawning , one reason the y2k type patterns work well now. 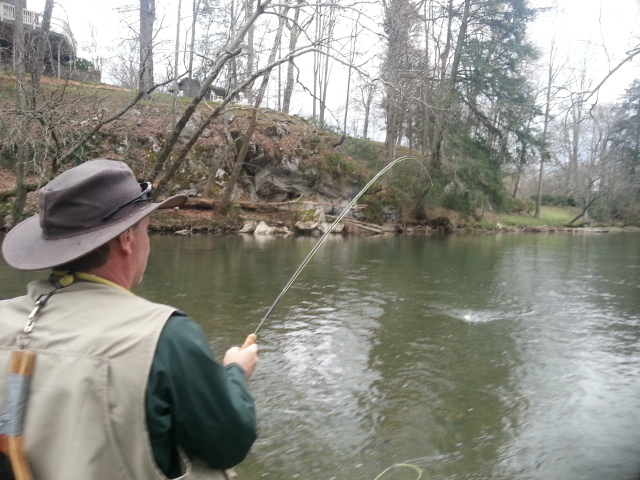 Ted was great to spend the day with, and is a good fly fishermen. I am headed out thus morning to guide a regular client of mine, Shaun Redgate, Forest, VA, and we have a line of heavy storms right at our backdoor. We were headed out to fish our private waters but where we were headed it’s muddy and rising as the rain moved in in the early am hours. 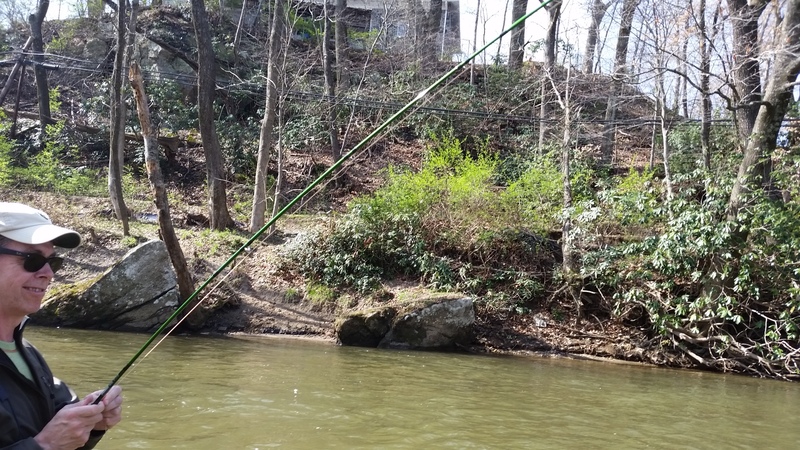 On to plan B……..we will see how long we can fish til we get wet. Have a great Friday. ….more to come…..
Lots of Guiding and No Sleep…. Apr. 1, 2015……Yes, that has been the theme lately. Very busy lately, making up ground from so many cancellations from late winter/early spring and I have been on the water for 6 days a week for some time now. Its the busy season, and its definitely in full swing. Been so busy the choice lately has been getting some shuteye or doing a fishing report. That was an easy call, especially after several long days on the river. Its been pretty good though, I’d say, and great fishing will continue indefinitely into the future. Should be great. Our April and May are almost totally booked, but June and July are two of our best months. Folks mistakenly think the ‘best fishing’ or best action is in April and May and that’s why you are booked. Nope. 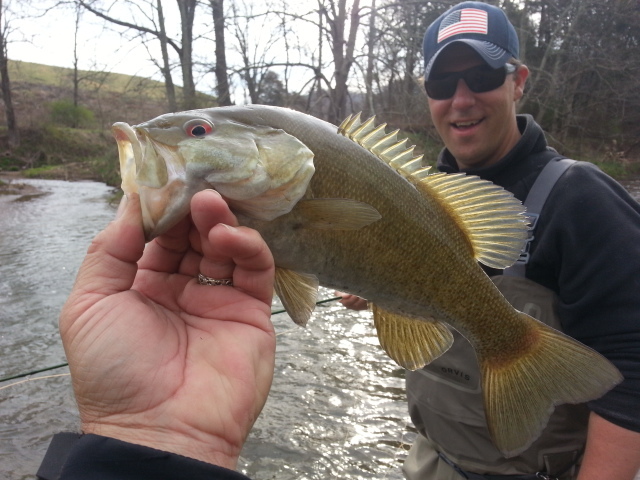 June and July are two of our best months and rich in variety as well when you add in a fish I love just as much as trout….smallmouth bass. And if you haven’t tried it you are cheating yourself. We are blessed to be in an area where we really have no down time, no closed season….no opening day. To me everyday is opening day. 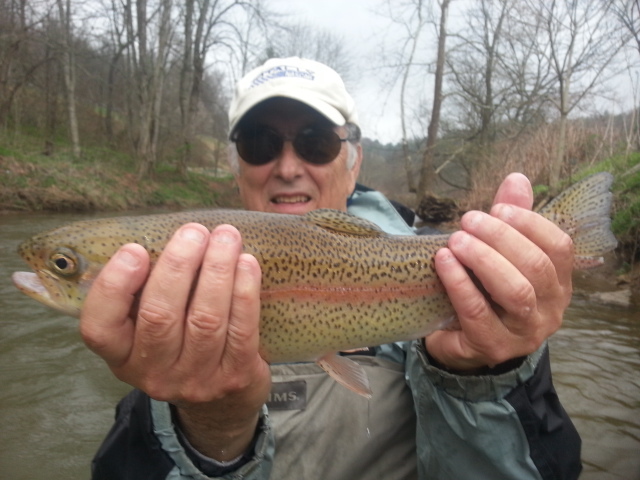 On Monday I guided Ken Okorn , Mechanicsburg, PA, Bob Thompson, Carlisle, PA, Chris Yasher, Harrisburg, PA, Jim Ritter, Enola, PA, Tom Brennan, Carlisle, PA, Chet Hagenbarth, Carlisle, PA, we fished a nearby NC Water in the am, TN South Holston River in the pm, we had some great fishing on the NC side in the morning fishing the Watauga gorge scoring probably 40 to 50 fish, a mix of rainbows and brookies. Mostly nymphs as it was raining and very windy, like 30 mph plus at times. We fished til midday and then headed over to the SoHo for the afternoon. Not many bwos as there have been, but that could have been due to recent chilly weather. We did however manage to net probably 20 to 25 fish in the afternoon, a mix of browns and rainbows, and mostly on bwo emergers or dry dropper rigs. 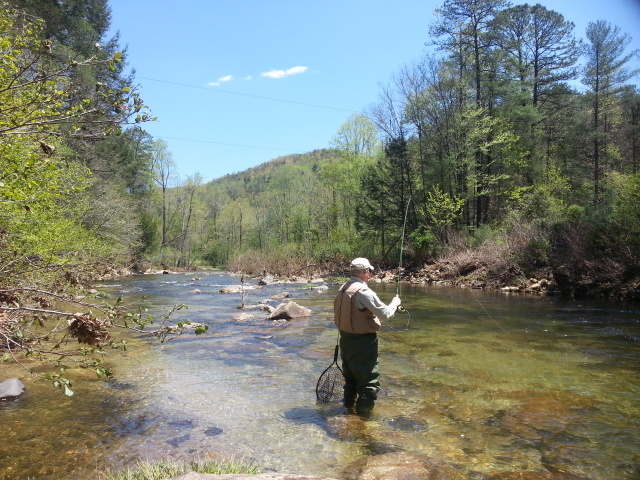 On Tuesday I guided another trip, Colter, Eli & Chip Cavin, Canton, GA, NC Mtns, and had a great day again yesterday, its been windy, very windy lately and this day would prove no different. Met the guys just outside Mtn City, TN, and we met at McD’s, and then were off. We headed to a couple of NC waters and had some good fishing, great in the morning, then a midday lull, then it picked up in the afternoon. 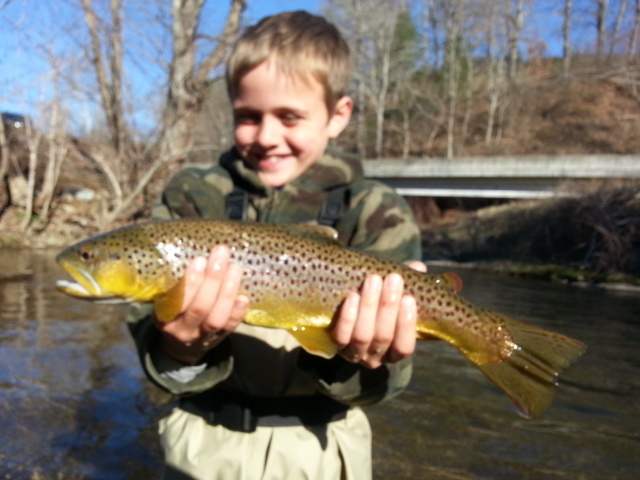 Eli, 9 yrs old, had a great day with 10 fish, including an 18-19″ brown trout that was amazing. 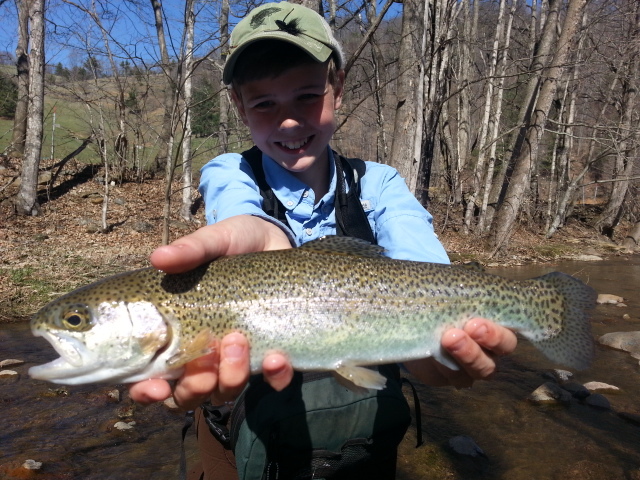 Colter, 13, had a great day as well and I think came close to 20 fish, and also caught a big brown. These guys could fish…..mending, casting, managing line…..I tell you they were as good as anyone I have taken out recently. I watched in amazement…….stunned. Chip, their dad, has done a great job teaching them and it shows. I was blown away. Colter in particular was so good I’d hire him immediately as a guide if he didn’t live so far away from us here. Chip did well also, netting probably 15 to 20 fish. We had a ton of fish hook up and come off, and still I guess we netted probably 40 to 50 fish total…..so it was a great day. Our bugs are celebrating spring and doing their thing, better hope the fly boxes are in shape as we are getting ready to get some of our best dry fly opportunities of the year. 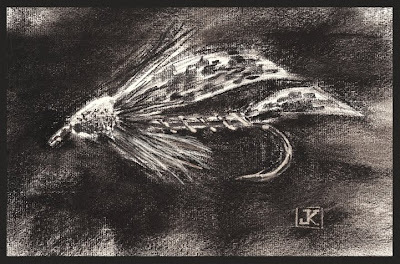 And of course, the nymph fishing will almost always be good. Hard to go wrong right now. Into stripping some meat? Streamers have worked well lately too, as Colter (above) proved this on our Tuesday trip by banging this big rainbow and 7 others flinging some meat. Be creative….hard to go wrong this time of year doing that. 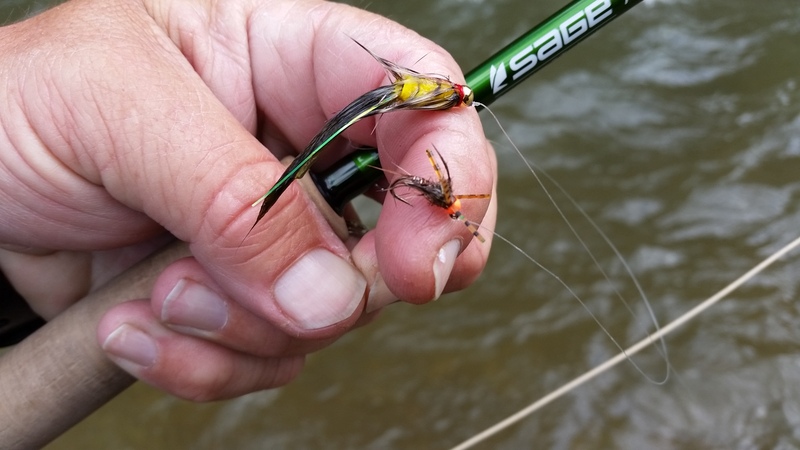 Also, moving your fly will entice fish to take….they are seeing a lot of ‘moving’ stuff right now….its caddis time, so swinging a fly downstream will work great. 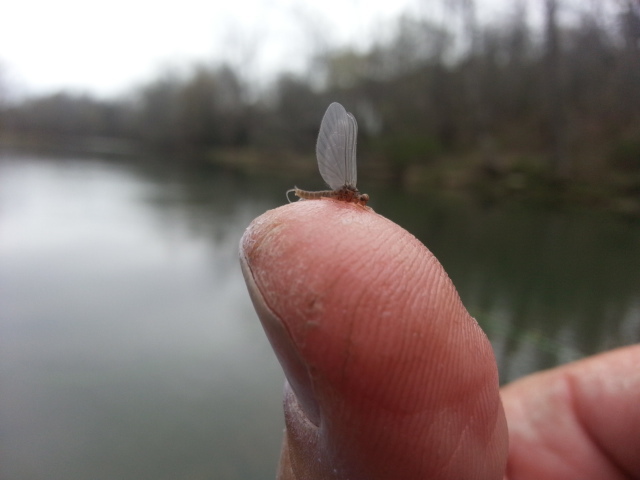 If you have not looked at our small stream hatch chart, you can download a FREE printable April hatch chart here , or by visiting our Fly Box page here. 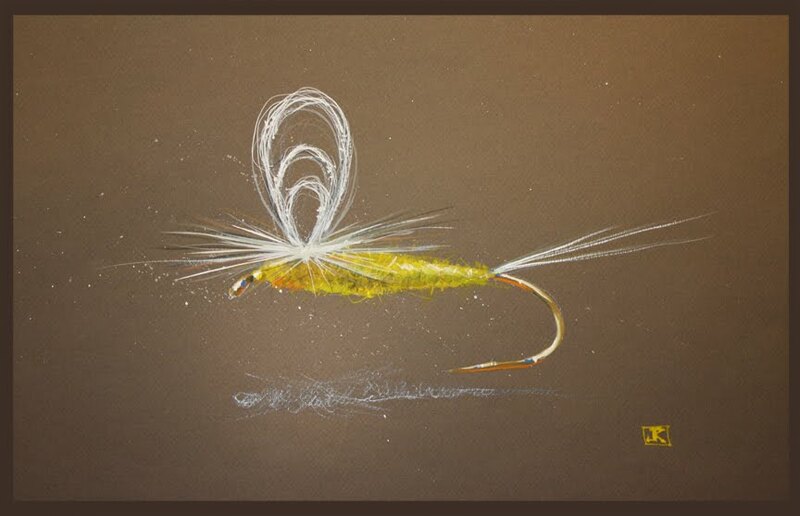 A busy week remaining, will be doing our Fly Fishing 101 class this evening, we have a full group …..12 students. Thursday I’m guiding Ted Linczak, Akron, OH, and on Friday Shaun Redgate, Forest, VA. I’ll wrap up the week by guiding Pete Bradley, High Point, NC, on Saturday. Then will be home to celebrate Easter, and the resurrection of our savior….the Lord Jesus Christ. Hope you are having a good week and happy Easter to you….